This has to be an all time winner. They don’t call it Jewish penicillin for nothing. It’s hot, homey and completely satisfying. Best of all it takes almost no time and nothing terribly special to make it. A final addition of a few vegetables and or precooked potatoes can make the soup into a really hardy meal. An all time favorite - nourishing and satisfying. 1 chicken about 850grams or 1 1/2 pd. 1 1/2 liters water everything in the pot should be covered. 3-4 precooked potatoes cut into small cubes. Wash the chicken well inside and out. Be sure to remove any small glands that are usually left in the bird. They sit along the back bone and are brown in color. They can make you soup bitter. In a pot just large enough to hold the chicken and vegetables, place the washed chicken in the pot with all the ingredients all at one time. The water should just cover all the ingredients. Slowly bring the water up to a genital simmer. Skim the gray slim and fat that floats to the top, while the chicken is cooking. Simmer gently for 50 minutes covered. Occasionally skim any fat that floats up the to top and discard. Remove the chicken from the pot and place on a large plate until its cool enough to handle. Strain the soup though a fine strainer to remove all the solids from the soup. Throw away the cooked vegetables. 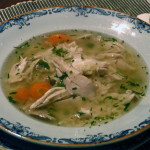 Taste the soup, if it is not strong enough in flavor, return to the heat and reduce the soup to around a liter of liquid. If you are not going to eat the soup right away. Place it on the balcony or in the fridge to cool which will make removing the remaining fat from the soup super easy. Take the chicken and clean all the meat off of the bones and shred with your fingers into bit size bits. Discard the bones, skin and cartilage. At this point you can add a few sliced carrots or other vegetables. Cook covered for approximately 20 minutes. 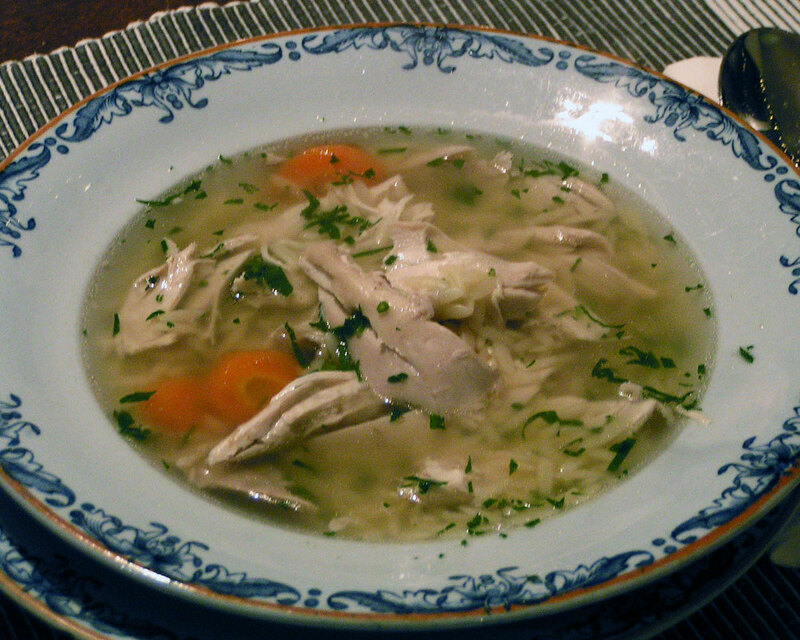 Return the chicken to the soup and warm up and serve. Correct for salt and pepper. I serve this with a little freshly grated Parmesan cheese. This will make between 1 to 1 1/2 liters or 1 to 1 1/2 quarts. You will need a pot with a lid that will just fit the chicken in it. It should not be to wide. The better the chicken the better the soup. Skim the soup - it will keep it clearer. Straining the soup will help get rid of all the small bits and spices. If you have the time chill the soup it will help get rid of all the fat in one go. It will float to the top and you can just scrape it off. The addition of a few vegetables and or precooked potatoes can make the soup into a really hardy meal. You should get about 1 liter, if you have more boil down you have about a liter.